It’s Ashley back again. This week I’m starting a NEW series called “The Secret to Make Him Chase You”. I wanted to dive DEEP into the psychological components of “the chase”. You can jump to the different sections below. I’ll be covering why men chase, why they stop or lose interest and how to trigger this “chase” instinct in a man so you can almost “hypnotize” and “mind-control” a man to chase you! A little background – I noticed in my own relationships; courtships where the man pursued me persistently in the beginning usually ended in long term relationships. On the other hand – when I pursued a man consciously or unconsciously, it never worked out the same way. This wouldn’t be a problem if the man chasing me were also the man I WANTED a relationship with. Unfortunately this wasn’t always the case. This led me on a journey (one of many) to unlock the secret to male psychology. More importantly, I wanted to know “how” to trigger a man’s desire to chase a woman. I was blown away by what I found. This is the secret I’m now passing on to you! (I believe women should pass on good advice about men and dating. We gotta help our fellow girlfriends out!). 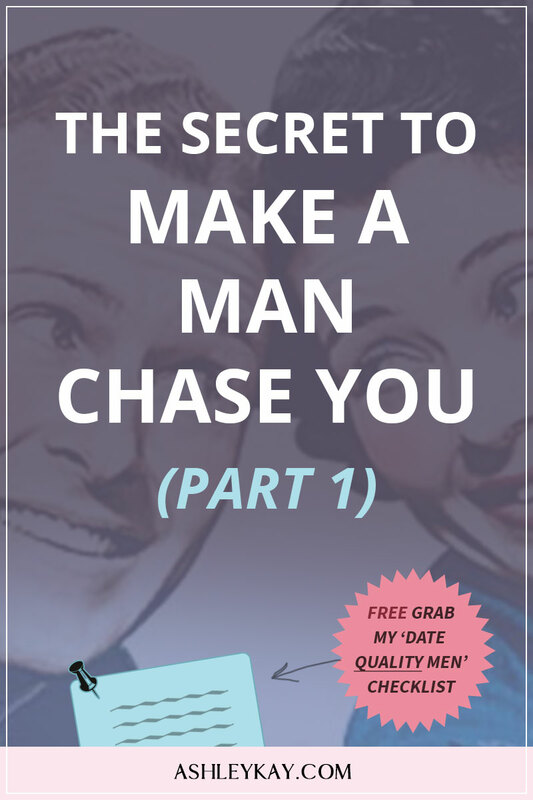 If you want to know how to easily and quickly get a man to chase you, you’ll want to pay close attention to this series. To begin with, let’s start with why a woman would want a man to chase her in the first place. Should a man chase you? Do men like to chase? 1. Men LIKE to chase because it strokes their ego. Men are very goal oriented and competitive. A large part of their manhood is tied to their desire to win and conquer “other men” and “win women”. Men conquer other men by beating them at games, sports and career positions. And by winning the heart of women OTHER men also desire. Deep down, men are always competing with one another to prove they’re better. 2. It’s human psychology we VALUE things that are hard to get. Imagine saving an entire year to buy a car vs simply having a car given to you. Intellectually we all want the car the easy way, but in actual fact, we feel a deep level of accomplishment and euphoria when we actually WORK to get that car. In fact, if you had to work for a brand new $40,000 BMW or Audi, you’re more likely to take care of it. It took me years to save up my Mazda 3 and after two years it still looked brand new. I’ve known women who trashed their cars after a month because they were GIVEN their cars. They didn’t have to work for it, therefore they didn’t value it and didn’t take care of it. Research has shown we tend to place an invisible “value” on things that are not easily attainable. Take the husband who gave his wife little attention, choosing his mates over her, until the day she left him. It’s the classic case of not appreciating something until it’s gone. The reason we tend to appreciate it after it’s gone is because “we want what we don’t have.”. Women who do not understand this concept actually DEVALUE themselves in front of men. Men are not dumb. If you’re friendly, positive, have your act together and take good care of yourself, men will naturally assume you’re chased by a ton of other men. Even if this isn’t really true, it’s what he will assume. This gives him a high-perceived value of you. Imagine instead of making him work to win you; you’re easy, you’re available, you always say yes immediately. You’re basically all over him whenever he calls…. His perceived value of you will GO DOWN. Why would a woman make it so easy for a guy? Because we think he’s a catch! You know, you meet a great guy who’s smart, handsome, successful and have good family values.. the whole nine yards. A guy like this doesn’t come along THAT often. When you spot him your natural inclination is to HOLD ONTO HIM. And that’s where we go horribly wrong. In this case our “natural instinct” are telling us to the do the very thing we shouldn’t do! The bottom line is…. if you want a man to treasure you, cherish you, work hard to please you, place you as his number 1 priority and set up the course of your relationship the RIGHT way, you must start by getting him to chase you. When a man flips on that “chase” instinct for you, it instantly RAISES your perceived value. Even if deep down, you don’t feel you’re that special or unique, he isn’t going to think that. He’s going to assume you’re the best thing since sliced bread. Make Him Chase You – Why Do Women Get It Wrong? Most women use “playing hard to get” to get a man to chase. It’s the most common tactic. It’s also deeply misunderstood. A lot of women and men have come to dislike playing hard to get because it’s often used BADLY. Playing hard to get is NOT “being cold and distant”. Generally if you do this, men will assume you’re not interested and stop chasing. Step 1: Be “Irresistibly Confident”. In order to get a man to chase you, you must adopt the correct mindset first. Human beings don’t like to be forced or pushed to do something. We must instead attract a man to want to chase us on his own free will. I’m going to introduce a concept I call “Irresistible Confidence”. Confidence is an irresistibly attractive trait. But when we think of confidence we often think of external confidence only. To have irresistible confidence is to exude confidence from the inside out. That’s why we must work on our mindset first. Everything starts from your mind! To trigger “Irresistible Confidence” we must switch from “HIM-focused thinking” to “ME-focused thinking”. To be HIM-focused, your thoughts revolve around the man. How can I get him to want me? The reason women think this way is because we’re biologically programmed to desire men for their resources. That’s why pretty girls go for rich men. And women prefer a man with a job. Whether you’re consciously aware of it or not, you’re always analyzing the amount of resources a man possess. A man with a lot of resources mean YOU could also have a lot of resources. Resources (security) are important for our survival. Note: resources do not simply mean money or assets, although that’s very common. Sometimes a woman will want a man to fulfil her emotional needs or to fill a parental role for her children. To be ME-focused, your thoughts revolve largely around fulfilling your own needs. Do I like the way he treats me? How can I have a great day today? Am I heading down the right career path? Am I happy with the way I look and feel? How can I improve my current friendships/career/knowledge? Being ME-focused is about focusing on your life and where it’s headed. If your life is in shambles and you feel out of control, focusing on men may seem like a better distraction. But what you’re really doing is looking for a “bandaid-solution” to a gashing cut of a problem. The price you pay for seeking a MAN to solve your problem is that you’ll often come across needy, clingy and desperate. This is the opposite of “irresistible confidence”, it’s unattractive. To trigger Irresistible Confidence, you must switch your thinking from “get guy for his resources” to “get your own resources”. The 70/30 Rule was inspired by The Pareto Principle or the 80/20 rule. This is where 80% of effects come from 20% of causes. This rule can be seen all throughout nature. In dating, I’ve modified this to the 70/30 rule. 70/30 rule should be applied as a ratio to the efforts expended by both parties. For example, expect a man to put in 70% of the effort and you 30% of the effort. If the ratio is closer to 50/50, a man is NOT pursuing; he’s simply reciprocating and doing the bare minimum to keep you strung along. Another example of where this rule comes in handy is to keep yourself focused on the RIGHT things. For example, 70% of your efforts should be ME-focused thinking, whilst 30% of your efforts should be on HIM-focused thinking. Do not get hung up on the exact ratio. It can be 80/20 or 90/10. As long as you’re focused on the right things (70-90% on YOU and him initiating), you protect yourself from falling into the trap of looking desperate and needy. Sounds odd at first until you dig deeper into male and female psychology. Most women have the natural capability to love unconditionally (it’s our nurturing instinct), but men lack this ability. Therefore to ensure BALANCE in a man and woman relationship, a man should love his woman more than he loves himself. Every time you feel an urge to go to a man, think of this push/pull concept. To PUSH is to put force onto that man. Asking him to do something. Asking him for confirmation of his feelings. Asking him the status of your relationship. Asking him if “he loves you”, “he misses you”, “how he feels about you”. This places PRESSURE on a man and often it’s unwanted pressure. If a man really likes you he may not mind answering once or twice, but to keep asking for reassurances is a big NO-NO. This is what “pushing” does; it makes a man feel this pressure to always “comfort you” or “make you happy”. Instead you want to think of “pulling” or getting a man to gravitate towards you on his own. Imagine you’re a growing planet. A planet is formed by rocks smashing together to form bigger and bigger rocks. The larger the mass of these rocks, the more gravitational pull it has for more rocks to fly into it. You want the feeling that you’re a “planet”. You don’t need to go out and get a man to want to be with you. You work on the natural gravitational pull of a happy and purpose driven life. When you’re focused on your life, a man will naturally see that as very attractive and WANT to a part of it. When I first started chatting to my now husband, I was in the midst of studying Art. My weekdays and weekends were filled with art assignments and studies. It caught his attention that every time he messaged me I would bring up my assignments and what I was working on. He told me he first fell in love with me due to my love and passion for art. Find a passion of your own and completely get lost in it. Look for a hobby or activity that can be All-Consuming. It needs to be interesting enough for you to effortlessly focus on it long-term. People are goal-driven organisms. If you’re not solving problems and going for a certain goal, your mind will become stagnant and depressed. When people stop having goals and achieving things, they often get bored. And BOREDOM is actually the biggest problem in relationships. If you know of someone who has three kids to three different men, or can’t help but cheat on every single partner they’ve had, or is secretly living a double life, it’s probably because they’re BORED with their life and need to invite drama! These are very poor solutions to the problem. Part 1 is all about mindset. Mindset is the first element to having ‘irresistible confidence’ so you can attract high quality men and effortless get them chasing you. But having confidence is not just THINKING confidently, it’s doing things that re-enforce that confidence and gives you something solid to hold onto. Part 2 is aligning your external behavior (and therefore expectations) so it supports and holds up your irresistible confidence. Have you ever noticed when you feel in control, you are naturally more confident? Or when you accomplish something you set out to do, you’re suddenly more confident as well? To feel in control, we need CLARITY and PURPOSE for our life. It’s an important ingredient to exuding ‘Irresistible Confidence’. Part 2 of this series, I’ll get into “how” to do this. 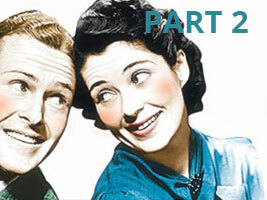 We’ll get into the nitty gritty of the “4 Behaviours of Irresistible Confidence”. It will be simple and easy for you to implement.